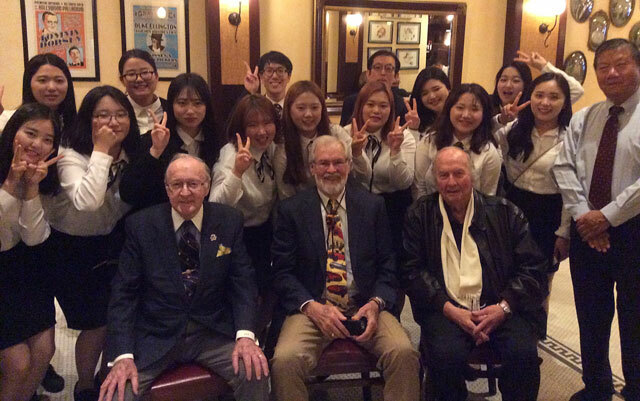 On Friday, February 19, fourteen nursing students from Kyungbuk College in South Korea met over lunch in San Francisco with three Korean War veterans from the Bay Area: Donald Reid, William McIver, and Oliver Johnson. And the encounter turned out to be rewarding for the vets and students alike. The twelve young female and two young male students are being sponsored by the Berkeley Global Institute (BGI). 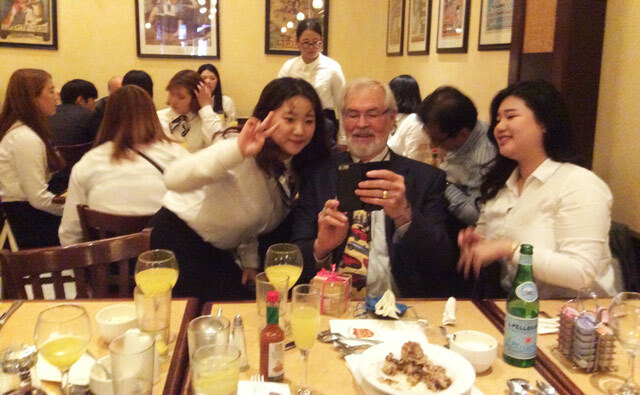 Those readers who were at our Groundbreaking Ceremony last July will recall the young women who sang the South Korean National Anthem: they, too, were sponsored by BGI. 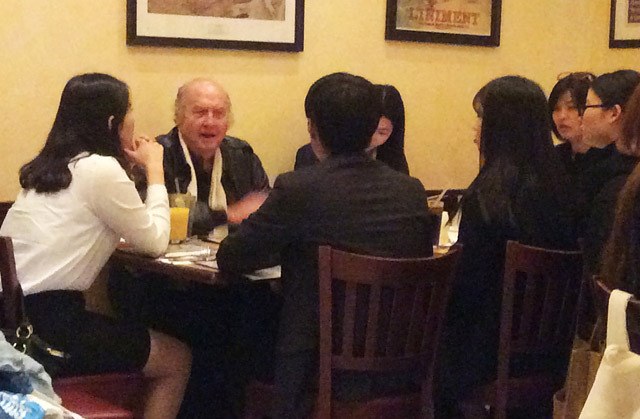 The luncheon took place at Sears Fine Foods restaurant in San Francisco, owned by prominent Bay Area restaurateur Man J Kim, KWMF’s Vice President. After a very brief period of cultural and generational awkwardness, everyone relaxed and began a series of animated conversations that never let up for a moment, and strangers soon became friends. 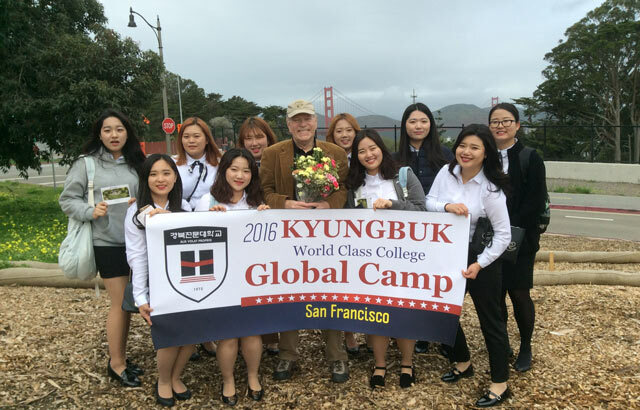 Earlier that day, the students had visited the Korean War Memorial site in the Presidio. KWMF Executive Director Gerard Parker met them there, and gave them a briefing on the significance of the Memorial, and of our plans and progress to date. After stopping to pay their respects at General William Dean’s grave in the adjacent National Cemetery, the group headed for Sears Fine Foods and the luncheon. And it didn’t take long for things to get quite lively. V-signs were quite popular with the students! 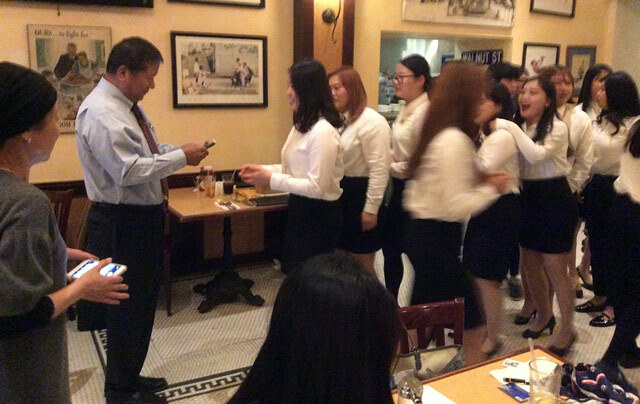 As the memorable event came to a close, Man J Kim presented each of the students with a brand-new two-dollar bill for good luck. Finally the students and vets had to part ways. 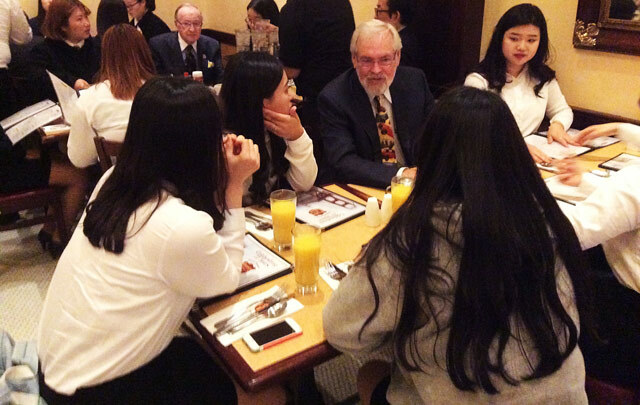 One of the young students expressed the sentiment of all when she solemnly said, “I shall remember this day always.” Among these young Koreans, at least, the Korean War and the Americans who fought in it will not be forgotten.